"If you've only read Ms. Cabot's young adult books, you're missing out. Size 12 and Ready to Rock showcases her witty, humorous, and keen ability to craft an effective and engrossing mystery. There are shades of Sophia Kinsella and Chelsea Handler in this thoroughly light-hearted, but definitely not lightweight story. " "Cabot (Big Boned) returns to her Heather Wells series with this fourth mystery. When Tania Trace, the new wife of Heather�s ex, Jordan, becomes involved in a murder during the first annual �Tania Trace Rock Camp,� New York College dorm Fischer Hall earns the nickname that fans of the series know all too well: �Death Dorm.� Quickly, assistant resident director Heather is involved in the case, along with her gorgeous new fianc�, Cooper Cartwright, a PI who is hired to protect Tania. 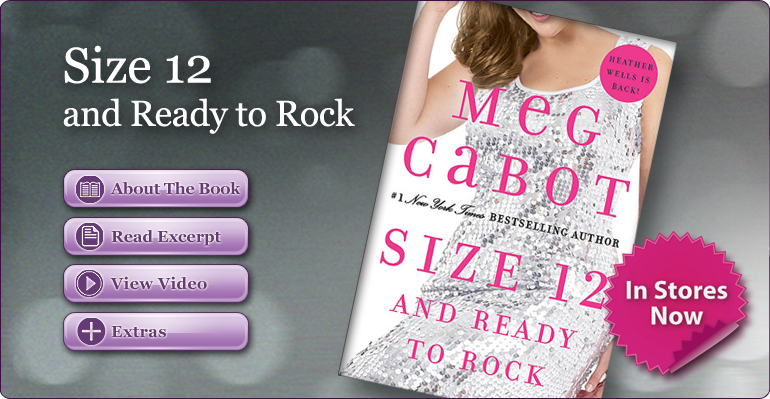 But when Tania reveals a troubling secret to Heather, Heather, an amateur sleuth, and Cooper must work to find the killer before someone else dies� [Size 12 and Ready to Rock has] the cute and amusing wit that Cabot instills in all her female protagonists. Readers . . . will recognize Heather, with her hilarious pop culture references and dry humor."